If you enjoy doodling around on your guitar, you are going to love today’s lesson. The groove you learn with Thinking Out Loud along with the special strum technique can really take you places. 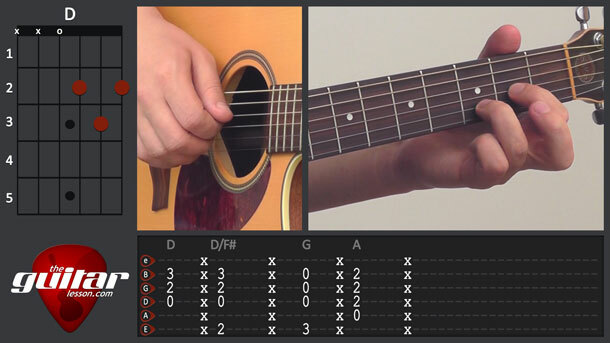 The guitar chords to Thinking Out Loud are simple open chords, nothing special. There is just 1 barre chord. If you are just starting out with the guitar, you can actually just play the chords, slap the guitar on the back beats, and it’ll already sound good, since the chord progression is really nice. Watch the rhythm, it uses a syncopation. If you are at an intermediate level, you’ll be able to take things further. During the lesson, I’ll show you a very cool slap-mute-pluck strum technique, which you’ll be able to use in this, and lots of other songs as well. We’ll go over each step of the technique in detail, and it will take a lot of practice before you perfect it. Stick with it, keep on doing it, and soon, it’ll sound right. It took me a few days to get it sounding good as well. We will be playing in the key of D major by the way. I really think you’ll have a lot of fun with this one, since it has such a great vibe to it. Thinking Out Loud was released by Ed Sheeran on his album titled X in 2014, and quickly reached the top of the charts around the world. Not only that, it stayed on the charts for months, which is rare. But hey, it is a great song. The song topped the charts in Ireland, Australia, New Zealand, the Netherlands, Denmark, Slovakia, Portugal, South Africa and the United Kingdom. It didn’t reach the top position, but got to the top 10 in several other countries including the US, Canada, Germany, Italy, Norway, Belgium, Spain, Austria, France, Poland. Sorry, but you've reached a premium content area. The download of the Thinking Out Loud tablature file is only available to premium members. Sorry, the same goes for the backing track. To download the backing track to Thinking Out Loud, please log in and revisit this page.